DAY 1: Welcome to the Fourth Annual Twelve Days of Christmas Cookies. Twelve days of cookies and treats that will fill your home with wonderful smells of Christmas. First up is a soft ginger cookie filled with dulce de leche, a thick milk caramel. You can spoon it into the center or use a star tip on a pastry bag to pipe the filling. 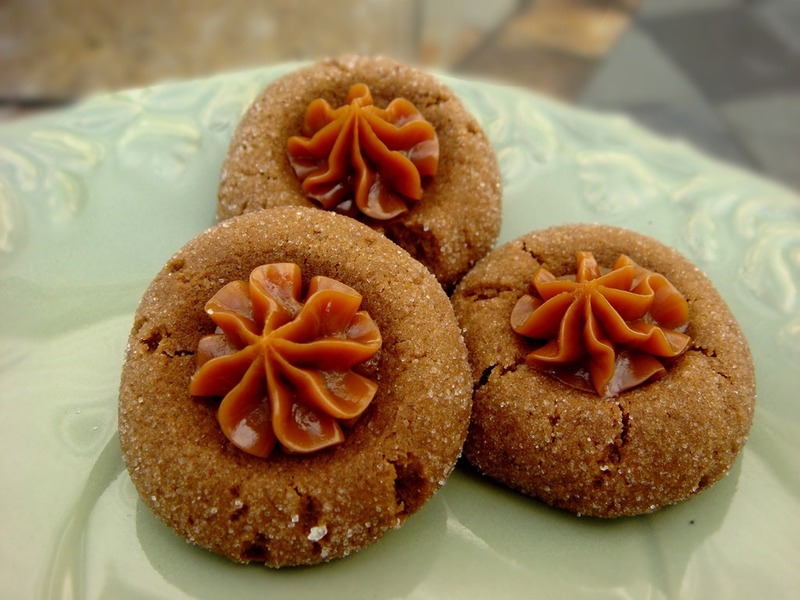 Dulce de Leche is a sweet rich caramel, so I like to make these cookies small. Use the back of a 1/2 teaspoon measuring spoon to make an indentation in the dough before cooking. As the cookies bake, the depression remains, but will puff up slightly. Immediately after removing cookies from the oven, press with the back of the teaspoon again to make the depression in the cookie slightly deeper. Cool cookies completely before piping in the dulce de leche. Whisk together the flour, baking soda, salt, ginger, cinnamon and nutmeg; set aside. Using a mixer, cream the butter and brown sugar together until light and fluffy. Beat in the molasses, egg and vanilla. Add the dry ingredients and mix until just combined and a soft dough forms. Chill dough for at about 2 hours or overnight. Preheat the oven to 350°F. Line baking sheets with silicon mats or parchment paper. Roll the dough into small balls (about 1 scant tablespoon of dough). Roll the balls in granulated sugar and place on baking sheets. 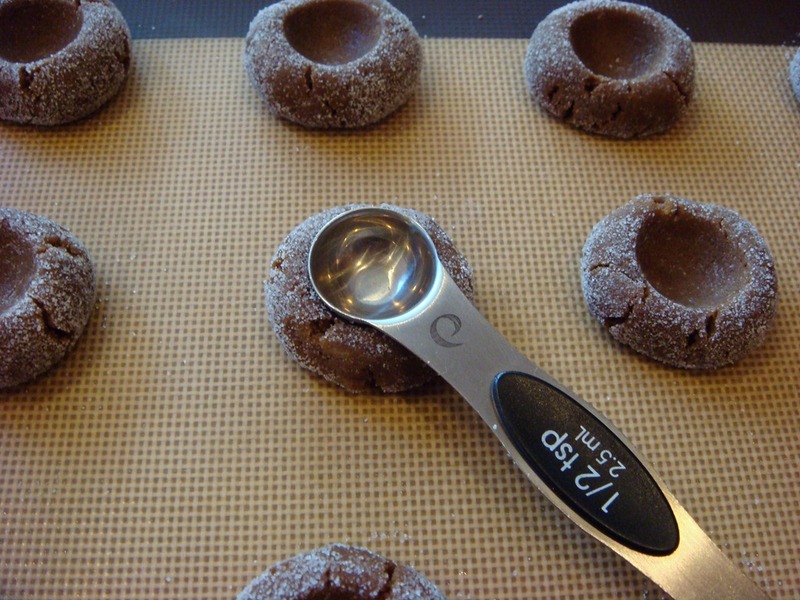 Use the back of a ½ teaspoon measuring spoon to make an indentation in the dough. Bake for 10-12 minutes or until slightly firm. Immediately after removing cookies from the oven, press indentation on warm cookies with the back of the teaspoon again to make the depression in the cookie slightly deeper. Allow cookies to cool completely. 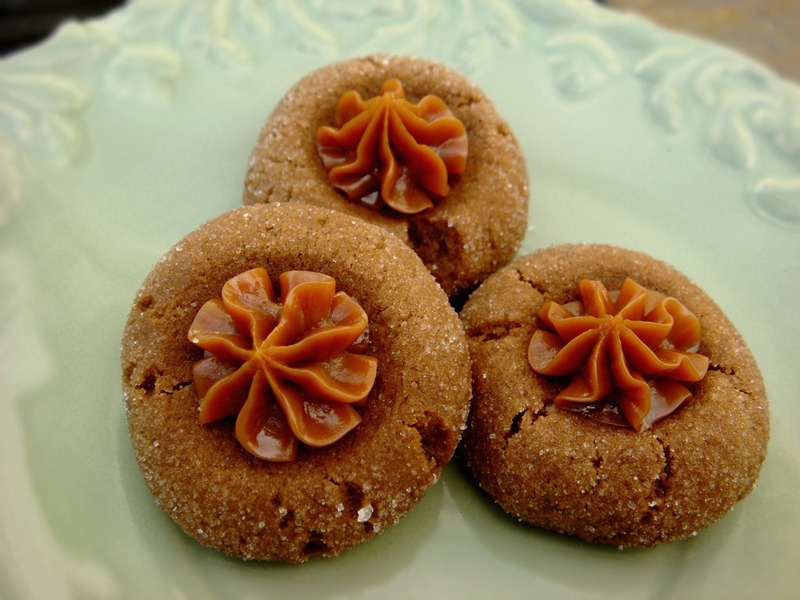 Use a star tip attached to a pastry bag to pipe about 1 teaspoon dulce de leche into the center of each cookie (Or just spoon slightly warmed dulce de leche into the centers of cookies). These sound so appealing. Think I’ll bookmark them to “recipes to try”. I think they might just go over during all the Christmas festivities. Guess I’ll need to check back for the rest of the story, The 12 Days Of Christmas! My mother used to do something similar, with the exception of dulche de leche cream (I must confess, that I never heard of it), instead she used several types of jams as filling.